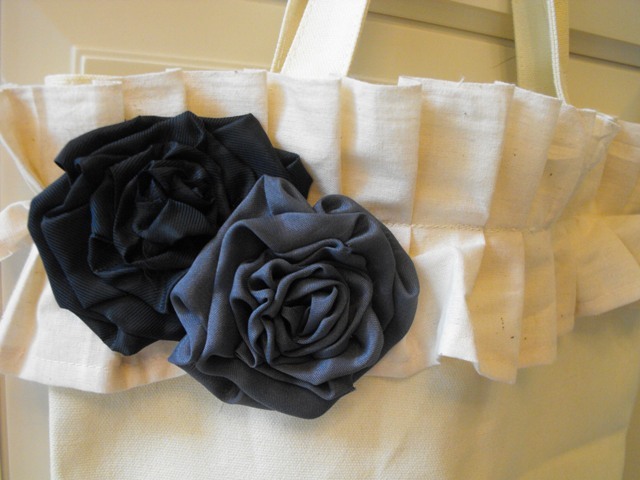 about making a ruffle purse but don't sew? You could make all three of these in one weekend for under $15.00? for that perfect fabric rose? I know you will be jumping in the car as soon as you read through this post. I will try and make it fast and easy for ya. 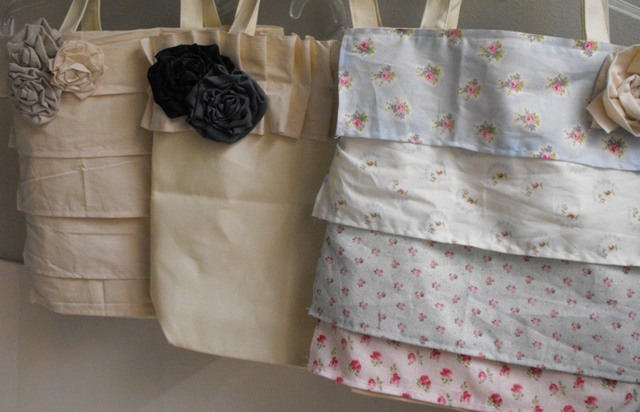 See the pack of three tote bags? They do most of the sewing for us! If you can cut strips of fabric and sew a seam. You Can make this purse. After I cut my five strips of fabirc 4 1/2 inches wide. I sewed down my seam. I then lined them up on my purse. Make sure you tuck the under layer of ruffle far enough under the top one. 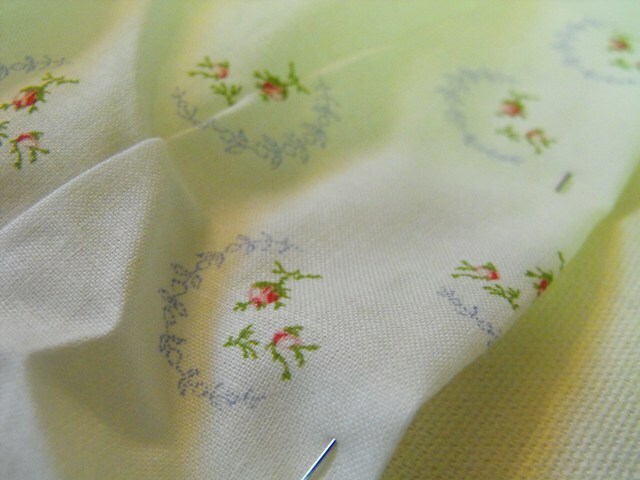 You would not want your seam showing..
Pin your ruffles in place and sew away. then work on the back. around the whole purse can be a chore. the ruffles wont be fluffy. I just had to show you a close up of this fabric. Now you dont have to go getting all fancy. Just sew your ruffle right on to your purse. See how finished it looks. I added one of my fabric roses. Here is the second one I made for when I'm not feeling Shabby. I just took one of the ruffles and gathered it in the middle. You will need to make your ruffle longer for this one. 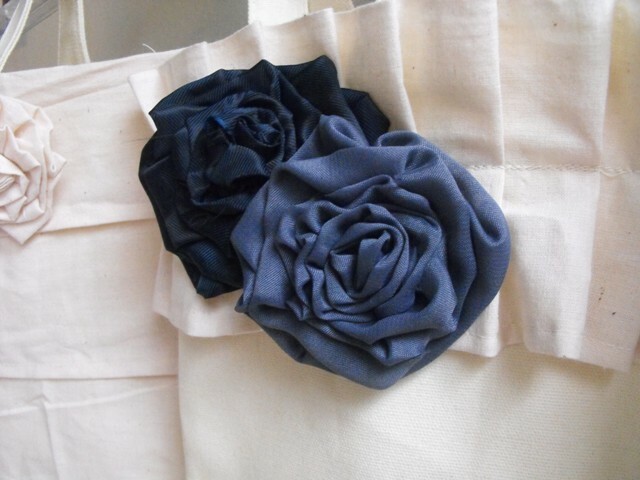 You can find my fabric rose directions here. I'm thinking these would make great Mother's Day gifts. How about gifts for the Teacher's? You can make them for everyone on your Christmas list! Now one thing I left out.. It would look so much nicer if you ironed them. Susie they are adorable! I like the wrinkles - it adds to the shabby chic look. Oh my gosh! These are so adorable! I have to make these, but you know by the time I get to Wal-Mart they will be all sold out. I can just see everyone in blogland having several of these now. What a great idea. You should have a bag party to show off everyone's creations. Absolutely adorable! And its true, I am headed out to the car as soon as I am done typing! Thank you for sharing and Happy Mother's Day! These purses are so cute! Your fabric roses on them look great! Oh I love those little purses. Hope I can find the bags at Wal Mart. Ours is being remodeled. It a whole 5 years old. We are no longer having fabric on bolts but pre cut of some kind. It's not in yet. So I will have to hunt for the bags, because everything is moved. Anyway enough complaining and thank you for the tutorial. 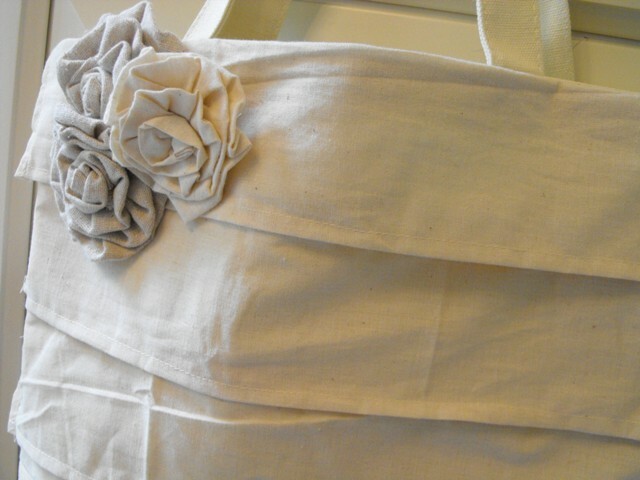 I love the all cream with the cream and gray fabric roses-so pretty! Thanks for sharing. 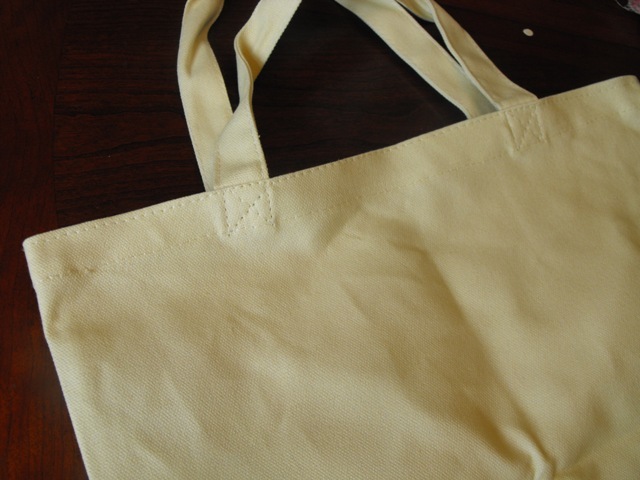 Oh oh I see another project comming on - Love these and will have to head out to look for these canvas bags. 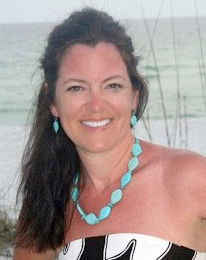 Love them all, they make me dream of flip flops, swimsuits and a good book, and oh yeah sunglasses. I am going to take the girls to the Wally and get some bags to decorate. I have missed all your recent stuff, so excited to catch up, life has been end of year crazy, hope to be back to normal by vacation time, fingers crossed. The Yard Eggs sign has me drooling, love it. 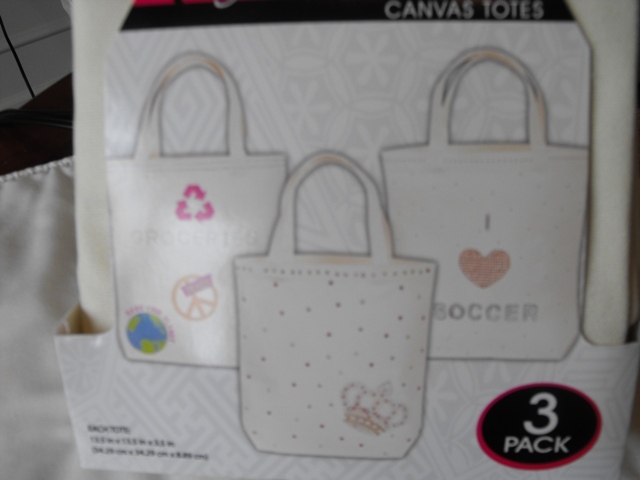 These totes are so cute. Thanks for sharing. Love & blessings from NC! Susie...I love these! Thank you so much for sharing. I think even I can do this! LOL! 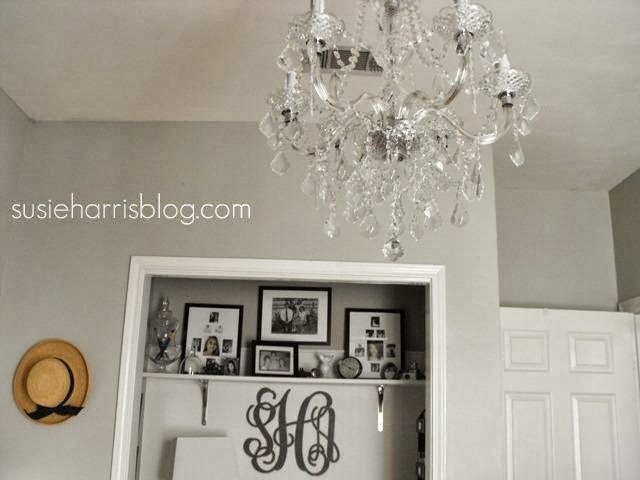 You always have the best DIY's! I have been a follower of your blog but I don't think I have ever commented! You have the best ideas ever!! I am also amazed I what you make. I am going to try this! I also wondered how to make the roses. I guess you found the bags in the CRAFT dept at Walmart? or by the purses? I'm TOTALLY making these. LOVE THEM!!! LOVE THEM!!! Did I mention that I love them??? Oh my gosh, you are brillant!! 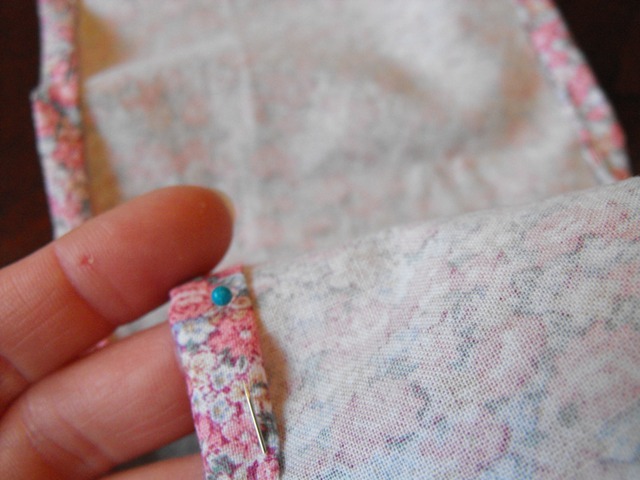 I love these purses, even I should be able to do these (sewing is definitely not my forte'). I love these--thanks for sharing. Adorable! Oh, the wrinkles will fall out when you put stuff in them!!! Oops. Disregard my question above. I see the tutorial on the rosettes now. Thanks! Can't wait to try these! I would love to say that you made Walmart UBER chic tonight. My hubby was there for 2 hrs getting a battery installed on his car. Darn it!! I would have gone for him had I seen this lovely. Ok...you had me at hello with your talent....now you have me for LIFE with your inspiration. I think you also gave me a FAB idea for a pillow. Oy...I have way too many pillows....but that ruffle bag...is mine. 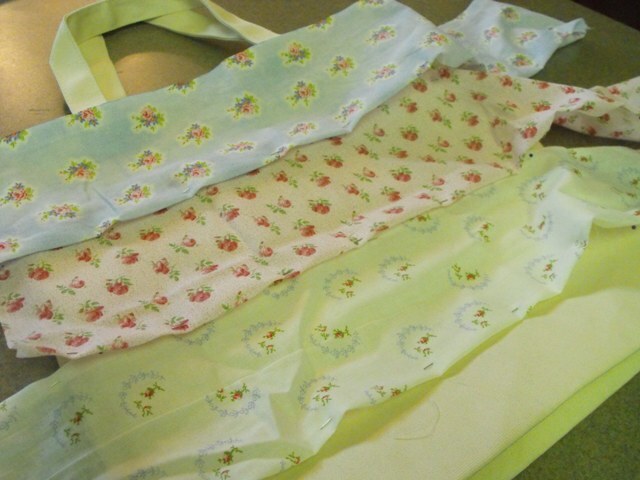 Very cute, I just used those EXACT fabrics for Elise's baby girls quilt... I love the vintage look of them! Oh Susie! I LOVE those!! 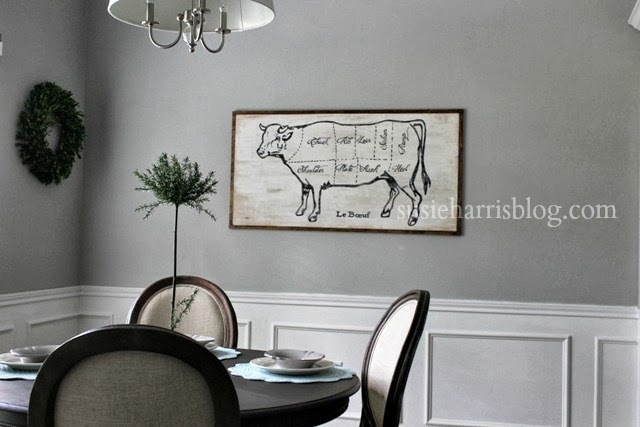 I have been secretly coveting the one Jeanne makes at Bushel and a Peck... but I'm on a budget... I bet I could do this! :) You are such a doll to share with us. These are just...wow! Thank you so much for sharing this little secret. I'm a new follower, haven't commented because I'm not so crafty. But I think I can do this one! How fun it will be. well that is such a cool idea! Susie, These bags are absolutely adorable. I even think I can make one with my limited sewing skills. Yours turned out so cute. Can I buy the 1st one!?!?!? Pleeeease. Cutsie, pootsie!! I'm going to make some of those. Thanks for sharing. Those are way cute Susie!! Love em! And as of yesterday, I have changed my blog to a brand spankin' new one...hope you will pop over and take a peek! oh how i love it!! I'll be making 3 of these this week! Thanks!!! Such a clever girl!! Love them! I'm on my way to Wal-Mart, gotta go....thanks for the tutorial! Love it! LOVE LOVE LOVE them!!!!! I am still doubting if I can even sew that much though! Reckon the fabric glue would work?!?! I am pitiful! Thanks for the lovely idea! I am going to attempt something like this!!! What a super idea Susie! I'm totally stealing it and going to get the fabric today. Thanks. cute, cute, cute! I love them all, but the floral one is my favorite. OH MY GOODNESS!!!!! How absolutely A-D-O-R-A-B-L-E!!!! Thank you so much for sharing!- now I just wish we weren't in the middle of moving this week- I can't wait to make some!!! 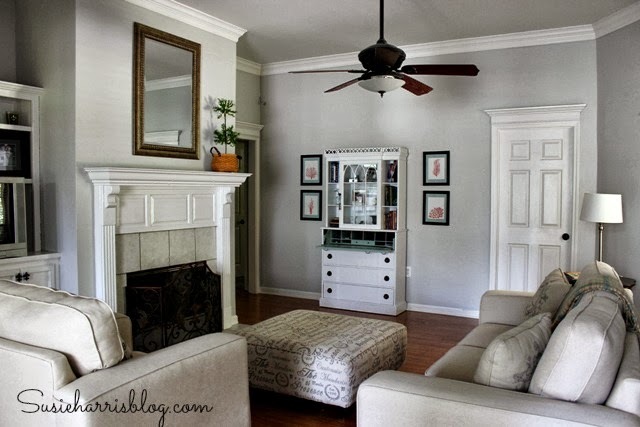 I saw something similar on etsy (A Bushel and a Peck) and on Faded Plains. Love these and I think I could actually make them! Thanks for sharing :). Oh. So. Cute! What a clever idea. And, a very good tutorial too. I agree, wouldn’t they be the perfect Mother’s Day gift, or gift bag? 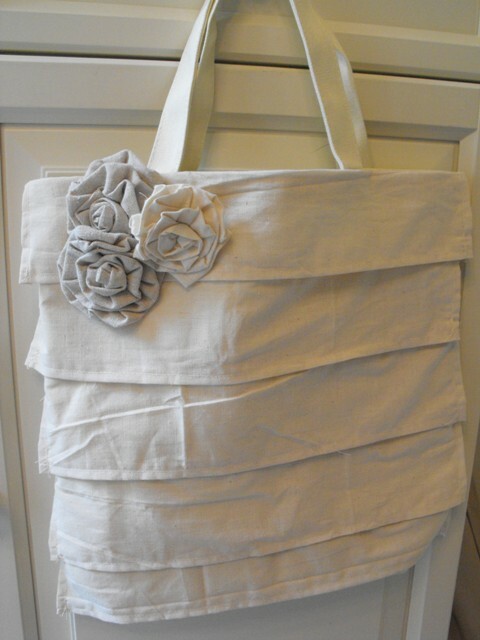 Or bridal shower gift bag? But first I’m off to master your fabric flower tutorial. I love, love, love those flowers. They are just precious!! I LOVE them. Thanks for coming by She Endeavors..you know, I went to Walmart today for ticking and they got rid of the fabric dept. can you believe that? Big old bummer. 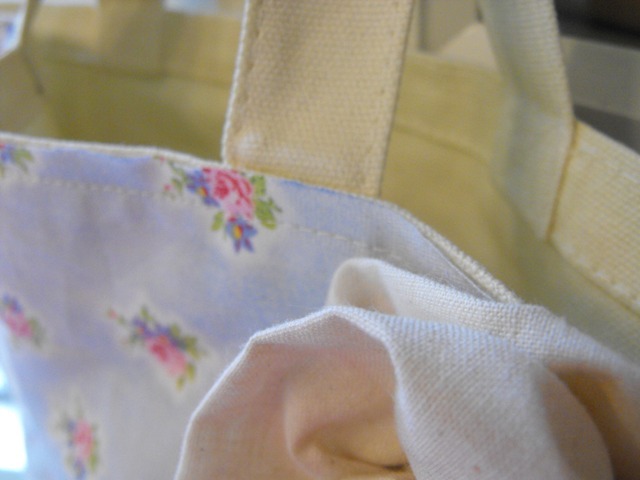 What a fun way to dress up a tote! I have so many of them too! Thanks so much for the great idea, I'll be linking. I can't sew a lick but these purses are as cute as they can be! Hello Susie; OH My Gosh!!! What a fabulous idea you came up with...... I just love your bags,,, I am off to the store,,,, tomorrow.. now I just have to learn how to do your roses...hehehe... thanks for the how to..... have great week. Seriously~these are the cutest purses I have seen in a long time...and it's been a while since I even purchased a new one...you are amazing, Susie! Susie, what a great idea! Unfortunately I live in Canada and our Walmart does not carry the same products as the American walmart, but I am going to go see if it might. I would LOVE to make a few of these. Thank you for your great ideas. Those fabric roses are something I have been wondering about for a while. Even I can make those! I LOVE your blog, I spent several hours reading it yesterday! You are SO creative. two comments: the wrinkles may fall out if you use Downey Wrinkle Release. Awesome stuff. 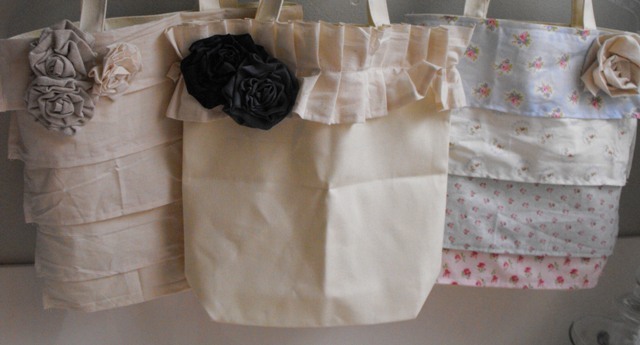 Also, I used your pleated ruffle idea and decorated my RE-USABLE SHOPPING BAGS! Blacked out the store logo with sharpie (it was a black bag) and then used an old blouse I didn't like and made ruffles, then sewed them on running vertically. I hate using ugly things - even utilitarian things should be pretty if possible. Thanks for this post, I love taking a common item and making something cute. Guess where I am headed tomorrow...this is a fantastic idea and I am going to make some for Mother's Day..thanks for the tutuorial and the inspiration...you are amazing!! 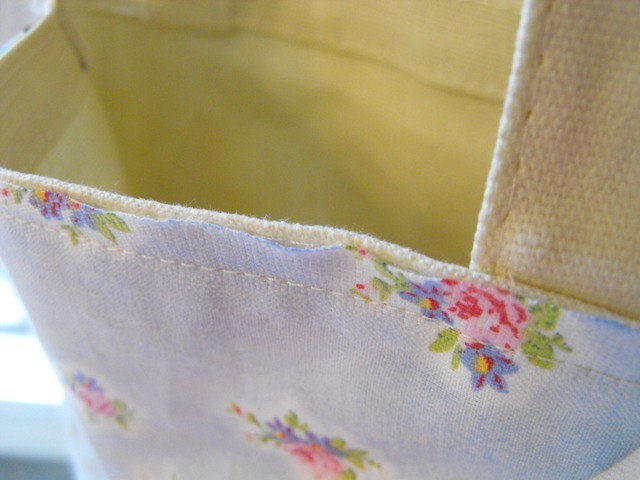 This inspired me to make a shabby apron with your techniques! I posted some pictures today of my creation. Had so much fun. Thank you, Susie. They are all so lovely. I will have to visit another Walmart our local one has almost nothing in their craft department. It is so sad. I will be looking out for these great bags. You did such a wonderful job. The fabric roses are perfect. Adorable! You did a great job. so adorable, I would love to buy the white "dressy" one from you! This mama does NOT sew. No ma'am. 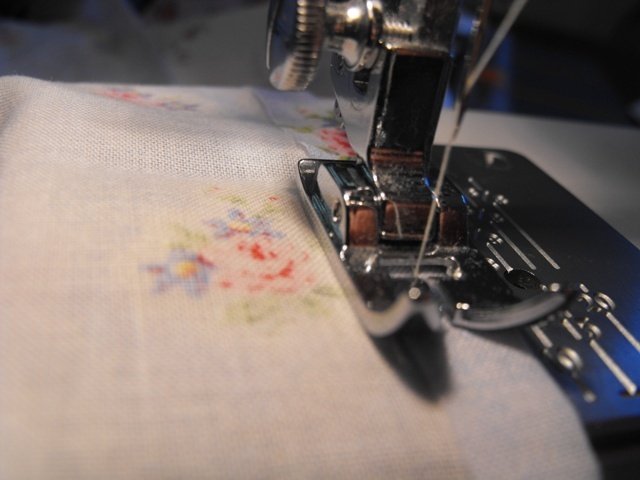 I don't own a sewing machine or even a pin (much to my mother's dismay). Anyway, if you are up for selling, I'm up for buying! How's that?! Oh I love you! Thank you, thank you for posting this! I have to try them. They're so adorable. My head is going to explode I'm getting so excited thinking about making, and carrying such a fabulous little tote around. Yipppy! This is such a great idea! These are so inexpensive that you could use them in place of paper gift bags! I am so glad you shared this project - it's going on my to-do list. Thanks! Hey! I just thought of something else! I've gotten some free promotional canvas totes that just hang around cuz I'm not too sure I want to be a walking ad for someone. But...I could just add ruffles to them. Now I am really excited! Thanks for sharing. I LOVE LOVE LOVE this!! So adorably girly! Can't wait to head on over to Walmart today to get supplies for this very inspirational post! Do your kids realize you are a genius? Such a great idea! Oh my! What a fabulous idea! I will most definitely be doing this! You could even still add a lining if you prefer. Thanks for sharing!! 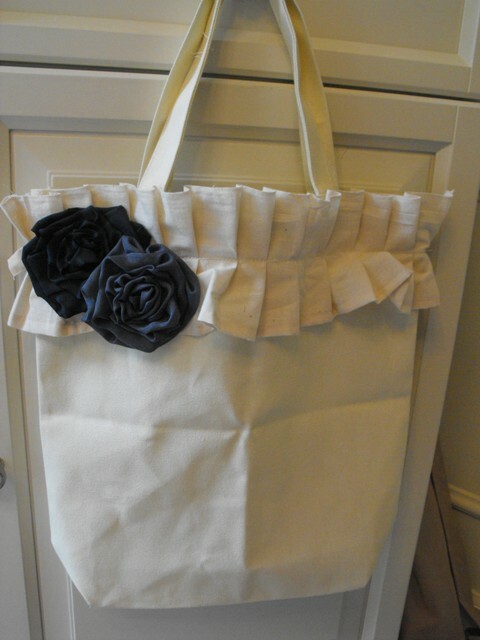 Love your blog and absolutely love this oh so cute bag! 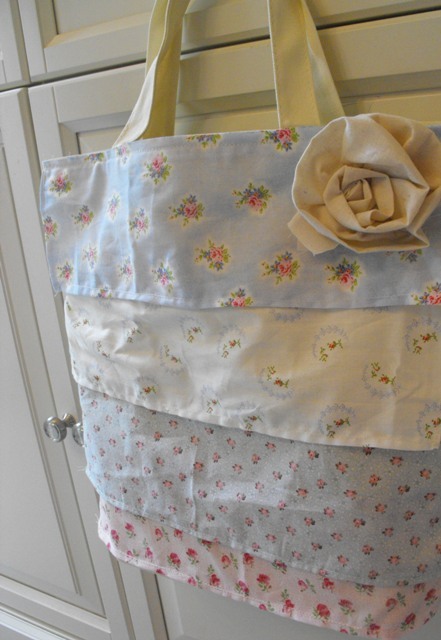 My 15 year old is sewing bags and this would be a great project for her but unfortunately we can't find them at our Walmarts here in Canada, do you think you could send me the measurements of the actual bag so we could just whip up our own? Thanks so much for the inspiration! OMG so cute! I would love love love to know how to make those beautiful flowers like you made! I have tried but mine don't end up even close to as pretty! Very Nice..will try this soon.. I love this idea. I will be linking you from my blog danggoodfinds.com on Friday August 12, 2001. Thanks for sharing! Hi there from the UK, I just found your blog and this 'ruffle' blog post is exactly what I was looking for. 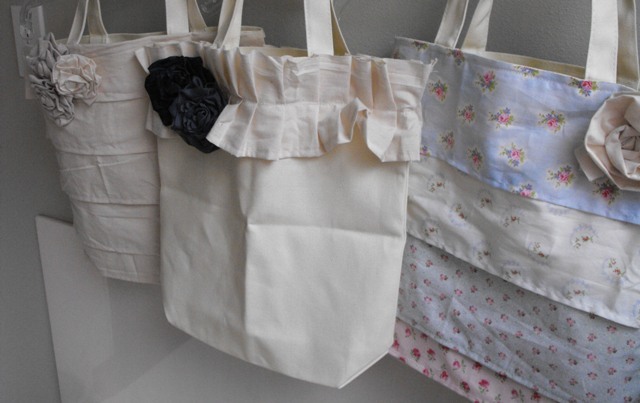 I am not a sewing expert but I love the ruffle effects on bags and other mixed media projects. Thanks for sharing your great tips. Lovely - and so simple. Your tutorial was well done. 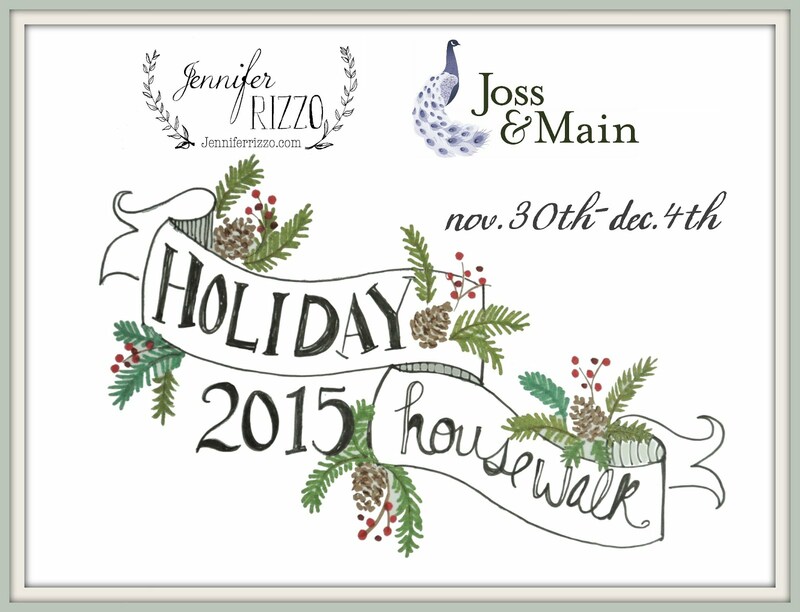 We'll be featuring! i just got the bags last night and can't wait! do you just ruffle on the front? it is TOO cute! thank you! I love these bags. I saw them on pinterest and had to make my own. I posted a picture on my blog with a link back to your post. I used a picture from your blog. If you would rather that I dont use you picture I will happily remove it. Just let me know. Thank you for posting such a cute idea. I love your blog and will be visiting it often. These are pretty cool. I love your flowers, they just make the bag look so chic. I know you must be lost without your iron! So FAB!! Love the unpressed look even more!! Did you sew the ruffles all the way around or just on the front? Yeah I like to know too! Happened by while looking for purse patterns to help my daughter learn to sew. I think we'll both love the creative ideas available from this simple idea. What a great way to get my daughter started with sewing! Thanks, Susie! Remarkable stuff in the blog I love the topic as well thanks. Thank you so0o0 very much for your kind help!! I am truly inspired from your write-up and sharing this too with my friends and colleagues. I know that this site has quality based content; I always enjoy reading your posts. I have visit this blog first time and totally enjoyed it really. Wow! They are so beautiful. I wanted to have one. you can check lucky patcher apk here. Sooo cute. I'm actually thinking of making few of these and sell it on my online shop. Enjoyed reading the article.Article is very informative. This Blog providing very nice information.Really explains everything in detail. I learn new information from your article. Thank you for this post. Good luck. Nice blog, thank you so much for sharing such informative blog.